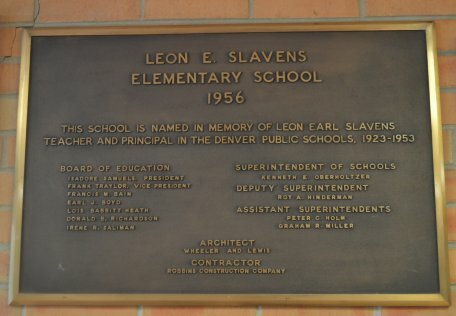 Slavens was named after Leon E. Slavens, whose gentleness, devotion to duty, and love for children inspired all who knew him. Mr. Slavens was born February 5, 1894 and died October 8, 1954. Teacher and Principal in the Denver Public Schools from 1923 to 1953. Wyatt Elementary School, 3620 Franklin Street, became affiliated with Slavens Elementary School. After merger, Slavens held classes for kindergarten through 3rd grade, while Wyatt had 4th through 6th grades. Both schools eventually became seperate K-8 institutions. Slavens was home to the DPS Student Services administrative offices, a city zoning violation, and a sore spot for the community. The classrooms were all divided into office cubicles. The black top playground was literally a parking lot, and the weed patch of a field had so many thorns that cars could not be parked on it. Encouraged by the court decision to end busing and the return of neighborhood schools, eight Southern Hills neighbors formed The Committee to Re-Open Slavens in September 1995. This group of mostly DPS graduates worked diligently to gather demographic data, determine interest in re-opening Slavens, and survey parents about what type of school they would like to see developed. A formal survey was mailed to 1,700 homes within the Slavens boundary in October. Our little group walked every block many times to extensively follow up. We had an overwhelming response, and over half of the surveys were returned by November. Survey results indicated that there were 300 children between the ages of 2 and 12 in the immediate neighborhood. The majority of respondents wanted a DPS school with a K-8 format and a rigorous academic curriculum. 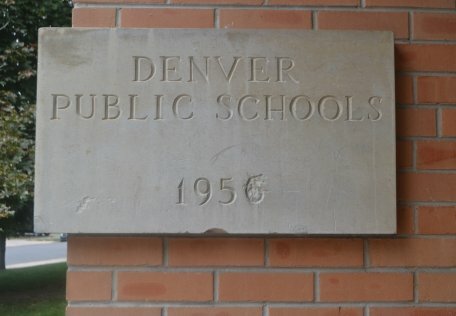 In December, our committee presented a formal proposal to the Denver Board of Education to re-open the school. Our proposal was professional and supported by factual data and small school K-8 research, in which we predicted a flagship school for the city of Denver. With school board approval, we went forward with mock registrations and by February 1996, Dr. John Leslie, Director of DPS Student Services, was appointed principal (which was handy since he already had his office in the building’s principal office space). We were to share the building with Student Services offices remaining upstairs and most of the lower level would be retrofitted back to classroom space for grades K through 3. The Slavens Dream Team was born; this design team was made up of the original committee and tripled as more community members, parents and teachers came on board to develop our vision for Slavens. 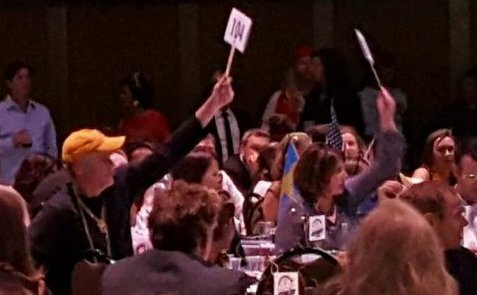 Amazingly even at that early stage, it was the Dream Team’s vision that originally deve loped many of the programs that are part of Slavens today. That vision included a progressive educational program, the Greening of Slavens field, strong parental involvement in CSC, PTA, the development of FOSS, Character Education, Music/Drama, Art, Spanish, community service, class trips, and a school garden. This all happened because parents were willing to make it happen with a very small starter budget. There was a “can do/no whining” attitude among us as we were volunteering and assisting in classrooms. It did not matter what was needed: painting, planting, installing, fixing, creating, talking, negotiating, grant writing, challenging and dreaming. We did this alongside outstanding teachers who created the strong academic programs. Slavens exploded with children and in 3 short years we were a full K-8 school. So this history belongs to you: the community of neighbors, young and old, the parents and our children. Today it is your legacy. Keep the strong energy and active participation in your child’s school as Slavens School continues to blossom. Thank You!